WHAT IS TS ICET and AP ICET? TS-ICET (Telangana State Integrated Common Entrance Test -TSICET) is for admission into M.B.A. and M.C.A. courses of all the Universities in Telangana State and their affiliated colleges. TS ICET exam is conducted by Kakatiya University, Warangal on behalf of Telangana State Council of Higher Education, Hyderabad. Kakatiya University has successfully conducted ICET in 2005, 2006, 2012, 2013, 2014, 2015 and TS-ICET-2016, TS-ICET-2017. APICET (Andhra Pradesh Integrated Common Entrance Test) is a state-level exam, held for admission to MBA/MCA programmes. The Andhra Pradesh Integrated Common Entrance Test (AP ICET) is conducted by Sri Venkateswara University, Tirupati on behalf of Andhra Pradesh State Council of Higher Education (APSCHE) for admission to MBA programmmes in universities and colleges in Andhra Pradesh. WHO IS ELIGIBLE TO WRITE TS ICET & AP ICET? i. For MBA: Should have passed recognized Bachelor’s Degree Examination of minimum three years duration (Except Oriental Languages) with at least 50% marks (45% marks in case of reserved categories) in the qualifying examination. ii. For MCA: Should have passed recognized Bachelor’s Degree examination of minimum three years duration (Except Oriental Languages) with at least 50% marks (45% marks in case of reserved categories) in the qualifying examination with Mathematics at 10+2 level. 5. The candidates who are appearing for the final year degree examination shall also be eligible to appear for TS ICET. i. Appears for Counselling at the notified Centers. According to the AP ICET 2018 eligibility criteria, Indian nationals with a recognised graduation degree can apply for the test. Candidates need to have a minimum of 50 per cent marks (45 per cent for reserved category candidates) at graduation level. Candidates in their final year of graduation can also apply for AP ICET 2018. Age Limit: There is no age bar to appear for the exam. WHAT SKILLS ARE TESTED IN TS ICET & AP ICET? WHAT IS THE EXAM PATTERN OF TS ICET & AP ICET? 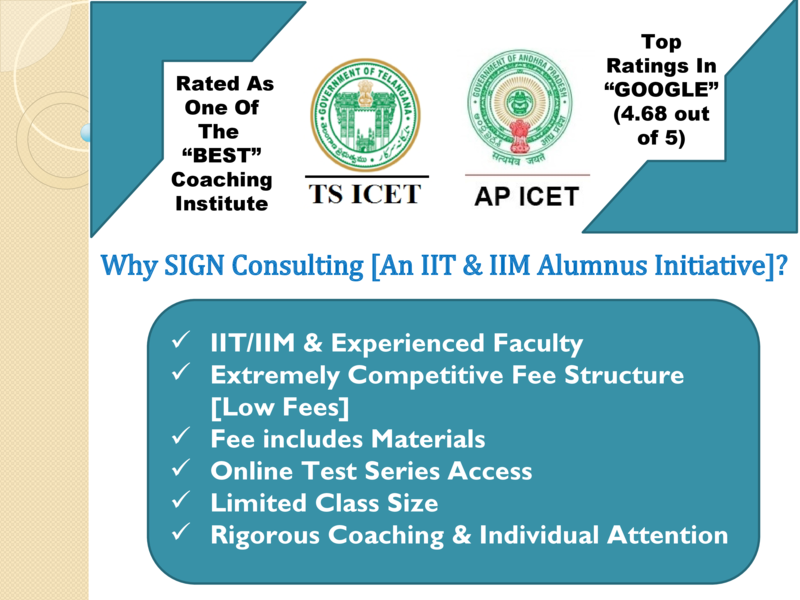 • The TS ICET & AP ICET exam is conducted in Online Mode since 2018. Prior to this, it was conducted as Offline paper based test. • The paper will consist of 200 objective type multiple choice questions. • The test duration is of 2½ hours (150 minutes). • Each question has 4 options out of which one is correct. • Each correct answer will be awarded 1 mark. • The unanswered questions or multiple answers will receive nil marks. • No penalty of negative marks will be imposed for wrong answer. • Medium of Test is English for Section-C.
• For Section A and B, the medium of test is English and Telugu in exam. • Qualifying marks in TS ICET is 25% and no minimum marks are prescribed for SC/ST candidates. WHAT IS THE FEES OF TS ICET & AP ICET? REGIONAL CENTRES FOR ENTRANCE TEST FOR TS ICET & AP ICET? WHO ACCEPTS TS ICET & AP ICET? Telangana University Nizamabad among others.